It’s almost never about you. Almost always it's about those you serve AND you. Major, longlasting success is 99% about helping other people get closer towards what they want. That said of course it’s important to set healthy boundaries for what you want and don’t want. For example, let image that this image represent what you're working on right now. Picture "your thing" when you're reading the rest of this email. Think about when it’s OK to ship things at 80% and when it’s not OK for you. We often ship later than what’s beneficial for all parties, think about, focus on shipping early not late.. Perfecting and inaction might from afar look very alike..
Because in reality.. No-one aligns 100% percent to your needs, or your service.. Thus the “real” target should look more like this,…. Quite messy right? How often do you ask yourself what it’s for, this this you’re creating? Who is it for? How do I make it clearer for those I serve and myself? Let’s redraw the last image (merge of goals) like below, for clarity. So if the dot is “your” target/goal/end results. 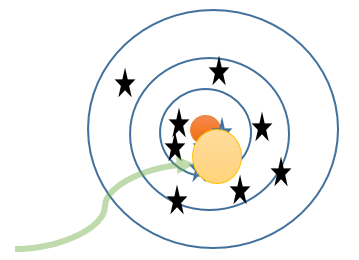 And the stars is the others goal-target.. same as above, but simpler. So ask yourself if you should invite the mindset that this yellow area should be “enough”? Would such a goal still help those you serve? Don’t work for "perfect hits". Work for creating or sharing value to others. You don’t know how much value you bring until you ship and listen for the feedback. Work for shipping because you never know who you’re service way more than you think you would in your current state of play. Work to ship early so you learn to become more aware of the others target/stars are. How often to you think about this overlap, and the way it can propel you and those around you forward? Have this made you rethink the design or your current goal?